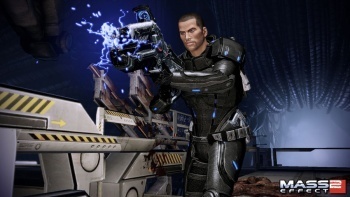 Microsoft doesn't think gamers should play Mass Effect 2 anywhere else but on the Xbox 360. PlayStation 3 owners might be getting their own version of Mass Effect 2 in January, but Microsoft doesn't think the one-time Xbox 360 exclusive jumping ship makes a difference. The company has spun the announcement by saying that the Xbox 360 is still the best place to experience the Mass Effect franchise. The ranks of console exclusives have dwindled in the current generation as developers realize that they need to squeeze as much money out of their products as possible. Mass Effect was a notable jewel in the Xbox 360's crown as a highly rated action-RPG developed by BioWare, which is no longer there. That is to say, half of the jewel is no longer there, because the original Mass Effect was published by Microsoft and will remain an exclusive to the Xbox 360 (and the PC, which Microsoft seems to have forgotten about). Microsoft told IGN: "With both Mass Effect titles launching first on Xbox 360 combined with the wealth of available paid downloadable content on Xbox Live today, Xbox 360 remains the best place to experience the Mass Effect franchise. And the original Mass Effect is absolutely an Xbox 360 exclusive, making Xbox 360 the only place to get the full Mass Effect experience." Microsoft does have a bit of a point, as Mass Effect's strength of carrying over every decision from previous games becomes a weakness for PlayStation 3 owners that don't get to take advantage of that. Though Mass Effect 2 is said to have an introductory portion that will help gamers understand what's going on at the beginning of Mass Effect 2, it's not going to be quite like playing the first game. Still, this is more of a positive for PlayStation 3 owners than a negative. BioWare has told VG247 that Mass Effect 3 coming to PlayStation 3 is a "good guess," so Microsoft looks to have lost the exclusive franchise for good. As I had to switch from Xbox 360 to PC when playing Mass Effect 2, I can attest that neglecting to carry a game save over to the sequel isn't that big of a deal, and the original Mass Effect had enough annoyances that I'm not sure PS3 gamers will care that much. Or everybody could just play the entire series on the PC, too.